To supply replacement one piece tanks, provide a temporary tank, strip out and remove from the site the existing galvanised tanks including craning and pipework. In December 2015 we carried out a site survey where we established the customers’ requirements along with the site conditions. This enabled us to ensure that the project would be carried out in the most cost-effective manner with minimal impact on the water supply. The Royal Hotel is a charismatic Georgian property located on Weston-super-Mare seafront and consists of 41 rooms, lounge, restaurant, bar and function facilities. 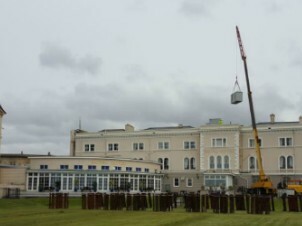 The brief we were given was to remove and replace the two existing 6ft x 4ft x 5ft galvanised water storage tanks located on the roof of the hotel. The management of the project was key to coordinate all the trades that were required on site at the same time. On the 29th February 2016, our delivery driver and installation crew along with a crane and waste disposal contractor arrived at the site. Craning the temporary tank onto the roof was the first task for the day. The installation crew were able to connect it up whilst taking the existing tanks offline this meant that the hotel water supply was only affected for around 5-10 minutes. The temporary tank used was a H1 250 litre tank from our standard one-piece range. Once offline we craned the existing galvanised tanks down from the roof where they were removed from the site by our waste disposal contractor. The two replacement tanks were then strapped and craned up to the roof. The final task for our installers included connecting the tank, taking the temporary tank offline and completing the pipework, valves and lagging.